You've reached CaberFeidh.com, the oldest Scottish Deerhound site on the web. It's also the repository of my earliest writings on holistic pet care, and stories about the animals who have graced my life. In 2005, my mother and Caber Feidh co-founder, Kathleen McKenzie, began to suffer from failing health, and we moved from Sonoma County to San Francisco. At the time we had two Scottish Deerhounds, Rosie and Rebel, and one Borzoi, Kyrie. Rosie passed away a few months after we moved at the age of 13 and a half. 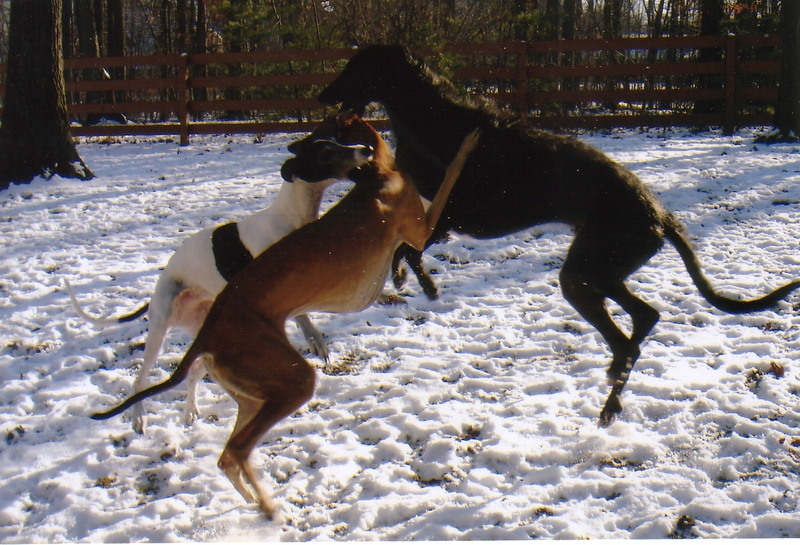 We were a "two-sighthound" family until Rebel died in August of 2009, at the age of 10 and a half. A month later, my mother passed away as well. As I struggled with the loss of my mother, I realized I had a Deerhound-shaped hole in my heart. Paula Pascoe of LeHigh Deerhounds in Michigan helped me fill that with my beloved puppy, Rawley, who joined my family in March of 2010. A year later, I moved across the country with him and Kyrie, to a four-acre country home in Michigan. Kryie passed away in the fall of 2011, age 12, and in November two rescue Greyhounds, Val and Stella, became part of our family. In some ways it's hard to keep this website alive; it reminds me somewhat painfully of my mother and of all the dogs who are gone from my life. Some of the articles on this site don't represent my current views on a number of topics, or represent only a part of my current views. But because it continues to have a lot of traffic, and for what I suppose are mostly sentimental reasons, I'm going to continue to maintain it -beginning with this updated index page. The best place to keep up with me now is to follow my blog, or to follow me on Facebook. I will be updating this site rarely from now on. If you are interested in a deerhound, please contact Scottish Deerhound Breeder Referral. If you wish to contact me for some other reason, please use this link, to prevent spam.